I scored a heck of a deal at the ASMS show. Sign up for IPMS (International Plastic Modelers’ Society) for $25, and receive a free kit. From the choices, I immediately selected Trumpeter’s 1/32 Late Production F4F-3 Wildcat. Not bad, considering you’d be hard pressed to find the kit selling for less than $45 (and even that on a good day). In 1940, as the world descended into war, the United States embarked on an aggressive expansion of its armed forces. From San Francisco to Houston to Norfolk, shipyards laid keels for warships. Aircraft production was increased, and new designs rushed into development. In 1941, the Army held a massive field exercise in Louisiana, with obscure historical figures such as Eisenhower and Patton playing prominent roles. On December 7, 1941, the Japanese launched a Pacific-wide offensive against U.S. military installations in the Pacific. Today we mostly remember Pearl Harbor. But concurrent with the attack on the Navy’s Hawaii anchorage, the Japanese also unleashed on the Phillipines and the small Marine garrison on Wake Island. By small I mean less than 500 men armed with outdated guns stripped off of WWI-era battleships and a small force of 12 F4F-3 Wildcats of VMF-211. Eight of the chunky fighters were destroyed on the ground in the first attack. The remaining four, like the U.S. carrier fleet at Pearl, survived mainly through the good fortune of not being “home” when the bombs fell. For the next fifteen days, the Marines on Wake scrapped together a hardscrabble resistance, beating off an invasion attempt and causing far more damage to the Japanese than their four Wildcats and handful of 5-inch shore batteries ought to have. The destroyed Wildcats were used to keep the intact ones flying, until those began to take damage beyond repair, in which case they, too, were parted out to keep the others in the air. On December 23rd the garrison, with the last of its Wildcats knocked out of action and facing overwhelming Japanese numbers, had little choice but to surrender. The Wildcat often gets a bad rap as the crappy plane we started the war with. And to an extent, yes. The Wildcat was outmatched by the Zero in most respects. But it, like the SBD Dauntless, was what we had. And if they didn’t win the war, they sure as hell kept us from losing it. From buying time at Wake and across the Pacific to kicking the Japanse fleet in the teeth at Midway to breaking it’s offensive power at Guadalcanal, the Wildcat was there at the turn. When the Hellcat and Corsair appeared in the later half of 1943, they still had a lot of war to fight, but the U.S. was unquestionably on the offensive. 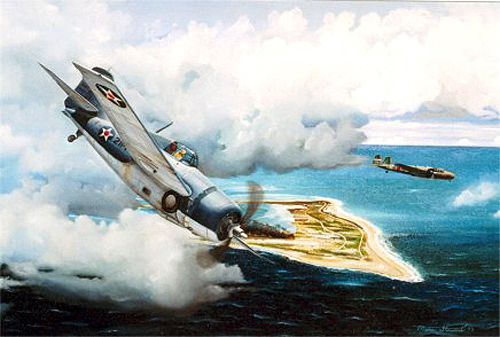 This December marks the 70th anniversary of the Battle of Wake Island (or Siege of Wake Island if you prefer). And if I have the bench up and functioning, I’m planning to build one of the last two Wake Island Wildcats as a very small tribute to the brave Marines who held a small patch of sand in the middle of nowhere against impossible odds for fifteen long days.